Tickets for the NSFF ánd special events can easily be purchased via the form below. Passe Partouts apply for the entire festival, including lectures, but they do not apply for special events or any other showings outside of the festival that are organised in cooperation with the NSFF. Tickets are, provided that the program is not sold out, also available at the door. Please keep in mind that not all tickets become available to purchase on the same date. To avoid missing out, check the site regularly, or subscribe to our newsletter. 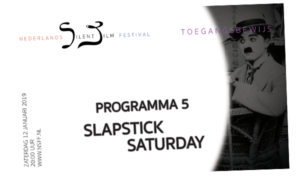 the wonderful feeling of supporting the Nederlands Silent Film Festival! Would you like to sponsor us with a higher amount? Please contact us!